The Hawkmoth is a light VTOL available to the Inner Sphere. Its light armor and high mobility allow it to skirt above and around the battlefield, tackling objectives and finishing off stragglers. The greatest weaknesses of the Hawkmoth is its lackluster damage potential and fragility, both comparable to a light hovertank. 1.7 Variant F "Evil Eye"
A long-range sniper variant. Probably most suitable for typical gunship duty - it can pop-up from behind cover at extreme range, fire a single damaging projectile, then hide before the enemy manages to return fire. When near the front line poking the enemy to distract them is a sound tactic. The greatest problem of this variant is lack of damage potential. While the LtGauss has incredible range, it also has a poor damage profile, meaning that this unit should prey on the wounded and focus fire on units that are retreating from the front-line for repairs while relaying Intel of the opposing units. Housing 16 shots per ton, the Hawkmoth Prime comes with two Free Tons bring the total shot capability to 48. Equipped with EOptics and BAP aid it in it's search for pry and enemy movement. The A has it's primary firepower relying on the battery of Small X-Pulse Lasers and Medium X-Pulse Laser. The MRM10 will come in handy if trying to harass an slower ground asset, of if the opposing VTOL is midst an stalling maneuver - unable to strafe the MRM hail storm. This variant boasts both the highest DPS and burst potential of the Hawkmoth family, but quickly loses steam around beyond 500m, and is useless beyond 700m. The effective VTOL pilot will use this variant to harass the enemy- punish 'mechs that attempt to focus you with an easily slung salvo of MRM10 before drifting behind cover- and quickly obliterate any 'mech that makes the mistake of ignoring this flying powerhouse. The Hawkmoth B is the de facto mid-range Hawkmoth. Not only sporting the second-highest DPS of the Hawkmoth family, it can tear into any 'mech up to 800m. The two Air RAC2 damage quickly drops to zero in the 800m - 1000m bracket, however a proficient pilot who keeps in range can still utilize this variant as an extremely capable Anti-Air asset, especially with the bonus damage Aerospace incur from Air RAC2. While it has two Free Tons to pack with ammo, it doesn't last more than just a few engagements- requiring you to return to the base, or a friendly APC; to resupply frequently. 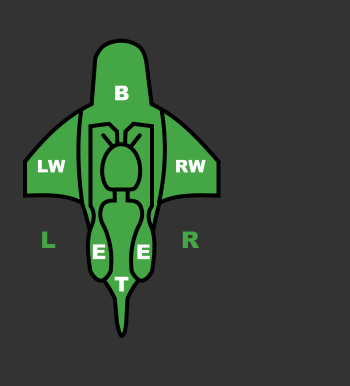 The other variants deliver their damage in short bursts and allow for short windows of maneuverability during combat, but the Hawkmoth B requires sustained focus on the target, limiting maneuverability options if you're intent on delivering bullets. While it may seem like a small downside, remember that only your maneuverability and 4.5 tons of armor to stand between you and a quick death. The C variant replaces the standard LGauss with a Thunderbolt 15 launcher and a TAG, trading direct-fire capacity for more damage and some limited fire support capabilities. The EOptics extend it's Tagging ability while the 2 Free Tons helps prolong it's stay in the field. An additional 3 ERSL allow it to not be completely helpless when out of Thunderbolt 15 missiles, but should be used wisely since any return fire will quickly melt through its reduced 4 tons of Armor. Much like the Prime, the C can paint a target outside the range of most weapons for allies, but whereas the Prime has some capacity for Anti-Air capabilities with its easy to aim LtGauss, the C is utterly helpless with its sluggish Thunderbolt 15. The Hawkmoth D sports the second-highest burst potential of the Hawkmoth family. The additional GECM reduces your radar footprint, allowing for nasty surprise attacks if you manage your range right. Its dual LPPCs provides a relatively strong mid-range punch the equivalent of a standard PPC as an Alpha hit or Chain-fired to keep your foe off balance. Backed by a pair of Air SRM4 racks with zero min range out to 498 meters. An effective pilot will use this Variant to support in a brawl, Chain-firing its salvo of screen-shaking projectiles to tip any 'mech encounter in your teams favor. However, it's short range of 500m means this variant needs to utilize good maneuvering and terrain cover to avoid being out-ranged by the average 'mech. This variant of the Hawkmoth's LPL and two Air SRM4 allowing for a good general-purpose VTOL. Compared to the other variants, it's the middle-ground in terms of both DPS and burst potential. The quick-fire Large Pulse Laser offers punishment against enemy aerospace and in conjunction with quickly-reloading Air SRM4 it can focus down components of ground assets with a steady hand. Effectively a flying Raven Prime, the Hawkmoth F carries the same iNARC 900 meter system plus TAG for painting targets a 1300 meters for missile attacks. The F also carries BHP which boosts detection range by 400m, C3 that distributes Radar readings to any teammates in range, and Air GECM reducing radar signature by 500 meters, which combined with its better targeting angles from being airborne as well as its greater speed, this variant can be used on any map for Intelligence Recon and Targeting. The F carries only three MGs which can be can be used to scape off a few more points or out an enemy near death out of it's misery. Priced at 62 500 CBills the Hawkmouth F is the most expensive of all the units but with it's Narcing and Intelligence gathering capabilities creates a formidable asset. Don't pass this unit by. The G Variant offers better damage output than the Prime variant and can pull limited AA duty, but otherwise fills much the same role at a closer range. The combination of a RAC5 means that a lot of lead is going to be falling on the target from 900m out, 2 Free Tons keep the RAC5 well supplied. At 500m 2 Air ERSBL kick in pounding out 291.06 of damage and 2 MG spraying continuous fire out to 1600m. Equipped with EOptics and BAP aid it in it's search for pry and enemy movement. 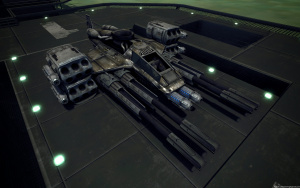 All five weapons perform poorly against targets with heavy armor, meaning that this VTOL is meant to be hunting Light 'Mechs, Aerospace Fighters and other VTOLs. Operating at closer ranges than those possible with the more sniper-oriented Hawkmoths opens this variant up to a lot of anti-aircraft fire. Up until version 0.7.0 there was no Hawkmoth D available ingame, because the name was considered "reserved" for an imaginary asset. The Hawkmoth D was a variant set up by KingLeerUK, one of the MWLL team's Lead Developers. The proposed configuration was 4 Long Tom, 6 Heavy Gauss, 8 RAC20, 1 MG with additional 4 LAMS, GECM, BHP and C3. See original post. The Hawkmoth D quickly became a common in-joke of the forum community, and is sometimes mentioned in discussions about alternate variants and anything regarding "overkill". There are promotional posters near some spawn points, showing Hawkmoth D advertisements. The Hawkmoth is the lighter cousin of the immensely popular Yellow Jacket VTOL. Another Michaelson Heavy Industries design, the Hawk Moth was designed around the Light Gauss, just as the Yellow Jacket was around the larger Gauss Rifle. Using the weight saved by the smaller weapon, the Hawk Moth can zip along at up to 130kph and also carries enough ammunition for a prolonged engagement at extreme stand-off range. However, it carries very light armor, and stands very little chance of survival when engaging outside the environment for which it was designed. This page was last edited on 24 March 2019, at 20:27.